Luton midfielder Alan McCormack admitted that Town’s players could have been a ‘little too relaxed’ going into Sunday’s match against Coventry. 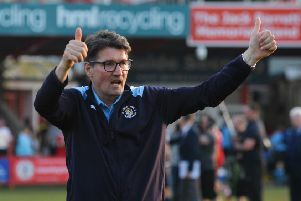 The Hatters could put their feet up on Saturday and watch second placed Barnsley draw 0-0 with Portsmouth, plus Sunderland cutting the gap to six points by beating Bristol Rovers. Although Town’s draw moved them five ahead of the Tykes once more and seven in front of the Black Cats, McCormack said: “Maybe results went for us and there was a different mentality going into the game, probably a little bit too relaxed that teams didn’t really gain too much on us. “It’s hard to say what people would have been thinking. "Maybe if other teams did win their games and gain on us, maybe we might have been better, if teams had lost, we might have got beat, you never know, football is a weird old sport, a crazy thing. “You’ve got to be mentally very strong, I try my best not to think about it. “I can’t do anything about other teams, I don’t play for them, I don’t support them. “It was strange sitting on a Saturday afternoon watching Soccer Saturday and the results, me and Collo (James Collins) stayed in the hotel as we didn’t want to travel in the morning, so it was a strange. "You check the results, but we try to keep it, worry about ourselves, one game at a time, and we’ve done that excellently so far. Defender Matty Pearson didn't mind having a rare Saturday off, but was glued to the TV screen to see how Town's rivals were doing. He said: "The only difference is we could see yesterday’s results, but everything else was the same. "It is what it is, I don’t mind it, at least you can see what’s happened the day before with the results. “As a footballer you don’t get to see all the results coming in and I enjoy that. "Even different leagues, looking at the results all the way up the Premier League, we don’t get that as we’re playing, so it’s good." Despite McCormack conceding the Hatters weren't quite at their best on the day , he was quick to point out the positives in extending the club's unbeaten record to a massive 21 games. He added: "It was frustrating because we kept giving the simple balls away and kept getting caught in the areas where we’re usually really good at, driving at teams and splitting teams open for the cut back. "So it was a little bit frustrating, especially first half. I thought second half we dominated the game for the whole second half, they couldn’t really get out, couldn’t create any chances, which is good, considering the chance they got in the first half. "We stopped them playing out, but it's another game undefeated and another point closer to the end goal, which is what we want at the end of the season. “We want to win every game, we know we’re capable of winning every game and dominating games. "We just had a little off day in terms of how quick we play and that extra touch we had, got us caught on the ball. "Give Coventry credit, they had a gameplan to stop us, dropping off and making it tight and compact and we couldn’t break them down too often. "But we still had plenty of chances to win the game, to go two, three-one, that might have been a fair result in the end. “It was just one of those days where we were only at 80 per cent best and we've still got another gear to go through. "If that’s the worst game we play for the rest of the season, I can see us picking up quite a few more points."